SureSteel stainless steel Tactile indicators are manufactured from a solid piece of 316 Stainless steel, so the Tactile head will never detach from the anchoring spigot. They are also processed in CTA Australia's proprietary SureSteel process to ensure your stainless steel studs look great and last the test of time. SureSteel stainless steel Tactile indicators are available in 3 basic styles, all with either a smooth or stepped side face and with or without a fixing spigot, including; - Concentric ring top surface - Grit in-filled top surface, or - Concentric ring top surface with taper screw hole. 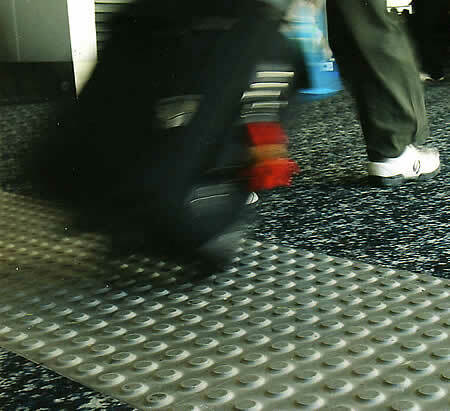 SureSteel stainless steel Tactile indicators are all R13 anti-slip rated, so you can rest assured your Tactile installation is safe with the highest possible level of anti-slip. SureSteel concentric ring and grit in-filled stainless steel tactile indicators, in either the smooth or stepped side face, exceed the slip resistance guide lines HB197.1999 for external ramps, walkways, pedestrian crossings and all requirements of the National Construction Code. ​CTA manufactures a complete range of interlocking templates to ensure your installation conforms to the Australian/New Zealand Standards. If you are installing, CTA can provide all the required technical support or we can supply/install anywhere in Australia through our extensive CTA approved and certified supply and installation network. In addition to the 4 standard colours, PolyPad retro-fit polymeric Tactiles are now available in 5 new designer colours. So, whilst providing a 30% luminance contrast is critical in conforming to the requirements of the Australian Standards, creative designers and specifiers now have an even greater colour palette to choose from. PolyPad retro-fit polymeric Tactiles are manufactured from premium polymeric materials and will contour to any substrate. They are easily shaped with a knife and are dimensionally stable so they wont move once bonded to concrete, bitumen, timber, pavers and most other substrates. ​PolyPad Tactile pads are available in 600x900mm format, so installation is complete by applying adhesive and sticking them down - 2 easy steps! The unique registered design of PolyPad delivers less joins, making moisture ingress and product failure less likely. No need for saw cutting and recessing. PolyPad is also available in 300x600mm format, so installation has never been easier.